The aim of the group is to continue building on the achievements of the SCA Green Schools project since 2003, and to work with other local voluntary groups to engender awareness of sustainability issues in Skerries schoolchildren through practical action. The Skerries Educate Together National School has been expanded significantly and a new outdoor learning Pavilion will facilitate more outdoor, biodiversity centred learning. Teaching staff and the parents’ group are eager to get this moving. 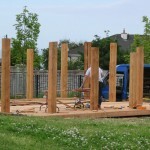 As the pictures, taken early June 2014, show, the construction of the outdoor classroom is advancing. SGG will be working with parents over the summer to implement the project for which we have been successful in obtaining grant assistance under the Local Agenda 21Partnership Fund. 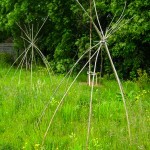 The project has a number of strands including biodiversity (insect hotels), organic fertiliser production (through growing comfrey) sustainability (seed collection), community gardening (philosophy of community) and dissemination e.g through school blogs. In our work with local schools we intend to draw on the experience and knowledge of Sustainable Skerries, Grow Your Own (Skerries) and the local branch of Birdwatch Ireland. Last updated in June 2014.